Nothing really gets you going as much as seeing drawings or animations of the gigantic sauropods. These majestic beasts have roamed the earth for just over 6,000 years and they are perfectly designed by their Creator, Almighty God! One of the most popular of these sauropods is Brachiosaur, a quadrupedal herbivore (that means it walks on all fours and eats plants)! This amazing sauropod exhibits amazing attributes assigned to him by His Creator! Had nostrils on top of the head. Could grow up to be over 40 feet tall. Very small head and brain for such a massive body. Needed to eat up to 440 pounds of food each day. Front legs grew out of his shoulders, thus giving him the name Brachiosaur which means”arm lizard”. First bones found in Colorado in 1900. Front legs are taller than the back, which is not common in dinosaurs. As is true of many sauropods, Brachiosaur had nostrils on the top of his head. 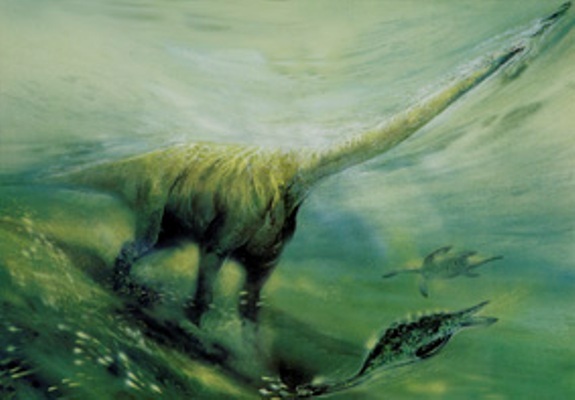 This led many scientists to believe that Brachiosaur might have lived in the water, like hippopotamus’ or something. But, when scientists observe the rest of the body they estimate that it would have been very hard for Brachiosaur to breathe if he was fully submerged (up to his head that is). This is due to the amount of pressure the water would throw on the chest of Brachiosaur. This pressure (nearly 30 feet off it) would make it difficult for the lungs to expand and pump air, even though it is possible that Brachiosaur could breathe at that depth, it just wouldn’t be ideal! Because of the tiny head people often wonder how Brachiosaur could ever eat enough foliage to maintain his body weight. Well, if you were to look down the jaws of Brachiosaur you would notice that he had a very useful tool, spoon/chisel-like teeth! These teeth would easily pull plants into the mouth, and then send them down (the tongue does this) the long slide to the stomach where they would be “chewed” up by rocks (called gastroliths) and acids. It is said that Brachiosaur needed 440 pounds of food to keep itself alive, this number could be true, but it wouldn’t be a problem for Brachiosaur! One of the most famous aspects of sauropods are their gigantic necks and long tails. These features bring no end of interest to the world; sort of like seeing a scaled giraffe, only much, much bigger! The neck and tail of Brachiosaur consisted of huge vertebrae that were built to take a load off the muscles. These vertebrae had some thin areas and holes, these little bits of weight that are taken off add up when you run down the length of the 83 foot creature! Although Brachiosaur had a small tail compared to others, like Diplodocus or Apatosaurus, it still performed its duties by keeping the Brachiosaur perfectly balanced. With an estimated 30-49 tons to hold up, the Brachiosaur needed amazing feet that would take the brunt of the load without making him look like bigfoot! Amazingly, the Brachiosaur had feet that are made up of the same kind of bones as our hands and feet, organisms called metacarpals (hands) and metatarsals (feet). These bones are laid out vertically and form a crescent. This would be equivalent to us humans walking on our toes and supporting 400 pounds of ourselves, all day long! 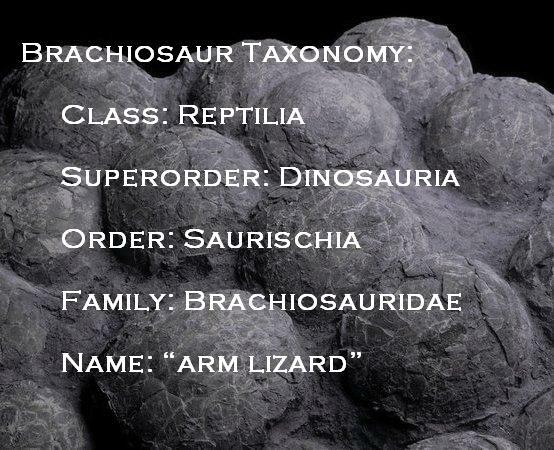 But, we know this was a perfect structure for the Brachiosaur because we have found more then one Brachiosaur. If the feet didn’t work we might have found just one Brachiosaur with broken toes, leg bones and some other, serious issues. As with all of God’s creatures we are again awed at the beauty, strength and magnificence of this dinosaur that is so perfectly made to live and thrive in the world God placed it in!